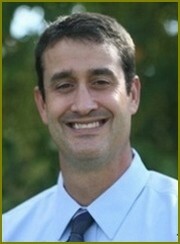 Dr. Roberts grew up in Athens, GA, and Graduated from the University of Georgia. He received his BA degree in Criminal Justice and Psychology in 1996. 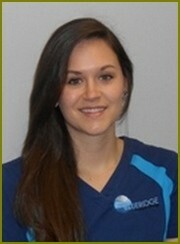 Dr. Roberts attended Nova Southeastern University, School of Dental Medicine in Ft. Lauderdale, FL. Here he received his Dental Doctorate, DMD. Dr. Roberts is a member of the American Dental Association, Virginia Dental Association, and is a fellow of the International Congress of Oral Implantologists. Dr. Robert's wife Marigny works at Lewis-Gale hospital as a pathologist and they have 3 sons. Dr. Roberts is an avid outdoorsman. He enjoys kayaking, mountain biking, hiking, hunting, and enjoys the Arts. Dr. Roberts treats every patient with the utmost respect and care. "Dentistry allows me to blend my skills in art and medicine to help patients." Dr. Roberts is committed to providing the personal, modern, and high quality dental care that our patients expect and deserve. I grew up in the small town of Giles, VA. I attended Wytheville Community College and graduated in 2010 with my Associates Degree in Dental Hygiene. As part of my education, I am also licensed to administer local anesthesia. I am currently a member of the American Dental Hygiene Association. I have been with the team since November 2010. I enjoy working with individuals of all ages and enjoy getting to know my patients on a more personal level in order to better their healthy, confident smiles. I currently reside in Riner, VA, with my husband and two small children, Landen and Ava, where we enjoy staying active with our church and community. On my own, I enjoy being a "girly girl" by shopping and reading. 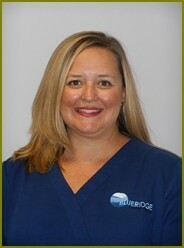 Hi my name is Andrea and I joined the Blue Ridge Dental team in April 2016. 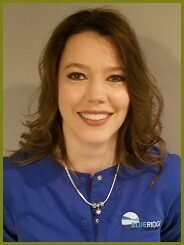 I have practiced as a Dental hygienist since 2014 when I graduated from Wytheville Community College with my Associates Degree. I was raised in the Pulaski County area and now live in Dublin. Growing up I knew I wanted to pursue a career in the health care field. I realized my passion for the dental field early on. I always enjoyed going to the Dentist, it was a fun experience for me! Working as a Dental Hygienist, I take pride in making a difference in the overall health of the community through comprehensive care and patient education I provide, it helps you feel at ease while in the office. In my spare time, I enjoy spending time with family and friends, volunteering at church, and being outdoors with my dog Pepper. Hello, my name is Hannah. My husband, John and I have enjoyed living in the Roanoke Valley for the past 11 years with our two fur-kids. You can often find us taking advantage of the area’s greenways and local culture. After a career in Property Management, I decided to make a move into the dental field in order to make a positive difference in the lives of others. 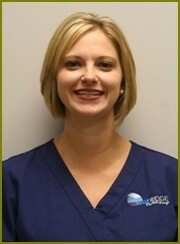 I enjoy helping our patients improve their lives by improving their oral health. I firmly believe that one’s overall health begins with their oral health. Hello, my name is Amanda. I was born and raised in Roanoke, Va. I have two children Ethan and Emilie whom are both very active in baseball/softball and a wonderful husband that has helped with their coaching. In my spare time, I enjoy playing with my two dogs Ella and Ivan and being at the baseball field cheering on my kids. I began working at Blue Ridge Dental Group in January 2017 and have worked in the dental field for a total of 9 years. I look forward to being a part of your dental experience, and being able to help you in any way that I can.